The Bay area is one chunk of California I long to return to, as much has transpired since I have been there last in early 2007. Coffee has taken off quite rampantly, with lots of promise and interesting prospects (you can see a sampling of such things in many Bay-based blogs such as Man Seeking Coffee or The Shot). Yet once again, I am tided over until I can make such a trip with some whole bean coffee from afar; this time, 12 ounces from Santa Cruz's Verve Coffee Roasters. Verve's Panama Elida Estate happened to be the third coffee from my partially debited GoCoffeeGo order and was definitely a coffee I was looking forward to. Not only has Verve won quite a few hearts with their stellar roasting and exceptional cafe operations, but the description of this particular Panamanian coffee truly had my mouth watering. I received the coffee roasted-to-order from Verve in a simple brown bag (one of very few quality roasters that strays from the CO2 valve) about four days after ordering. I mugged the coffee in the usual three methods of french press, drip and siphon. The french press initially exploded with a fusion of raspberry and date, followed by a little lemon grass and following in the caboose was a tinge of smokiness. I was tremendously pleased with not only the flavor but the smooth body of the coffee. The drip also produced a strong, sweetly sour berry flavor with the subtle taste of date, but the cup had much more of a smoky flavor. Overall, there was a nice sweet and sourness to the whole cup and still a nice smoothness. The siphon stood out with a still beautifully berry-licious cup of coffee, though there was much less of the strong sweet and sourness and more of a light, tea-ish body. This cup was also much earthier than the other two. As I neared the end of this coffee, I really wished I had more of it to go around. 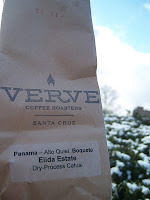 If you're looking for an amazing, flavorful Panama, definitely try out this particular crop from Verve while you can. Ever since I've had easy access to Verve's handy-work -- Both Sightglass and Farm:Table in San Francisco are wholesale customers -- I've been mightily impressed with the product Verve puts out. So much so, that the first chance I had to visit Santa Cruz, I made a little pilgrimage of sorts. The Bay Area has, indeed, exploded with good coffee. I'm truly fortunate to live here. The Panama sounds absolutely wonderful. I'm going to try to get my impressions of the bag of Burundi Bwayi I procured while I was there up as soon as time will allow.